We visited the Old Melbourne Gaol on the weekend of the National Trust’s 60th anniversary. It was a cold and dark day in Melbourne which I really think helped the old Gaol enforce its intimidating impression on us! With all of this combined, you got an extra sense of just how hard life would have been on the inside of those bluestone walls. 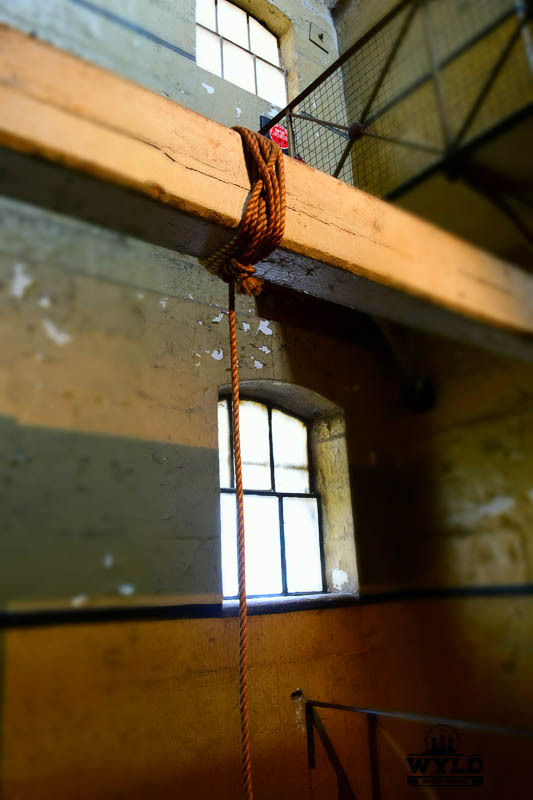 Even with all of this, we found the Gaol to be an amazing attraction to visit in Melbourne. If you have seen “The Green Mile” you get the feeling you are walking death row when you step into the old Melbourne Gaol and see the row after row and level after level of tiny cell doors. It all can be extremely overwhelming. Each cell is about 2.5 metres long by 1.5 metres wide and all the cells on the bottom floor are open to exploring. 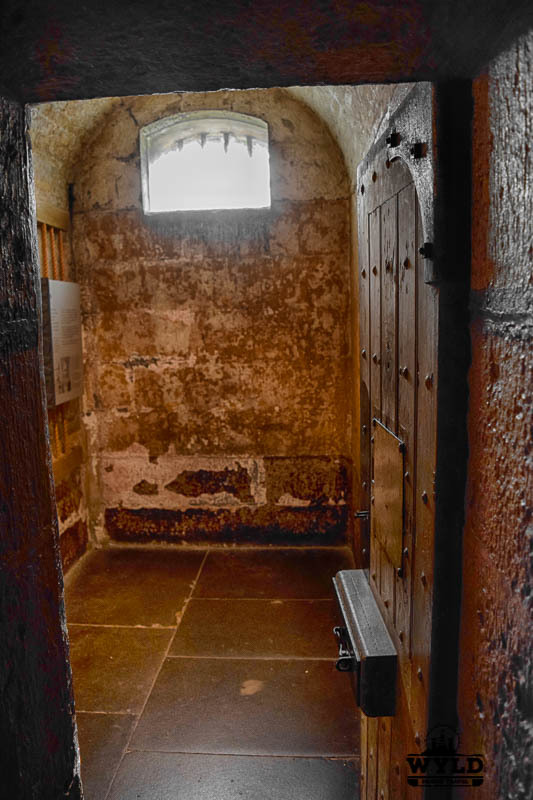 The cells have an information plaque on the inside that lets visitors know about the criminals who lived in that cell. There are even displays of restraints, weapons and even replica’s of Ned Kelly’s famous armour and the guns he used. 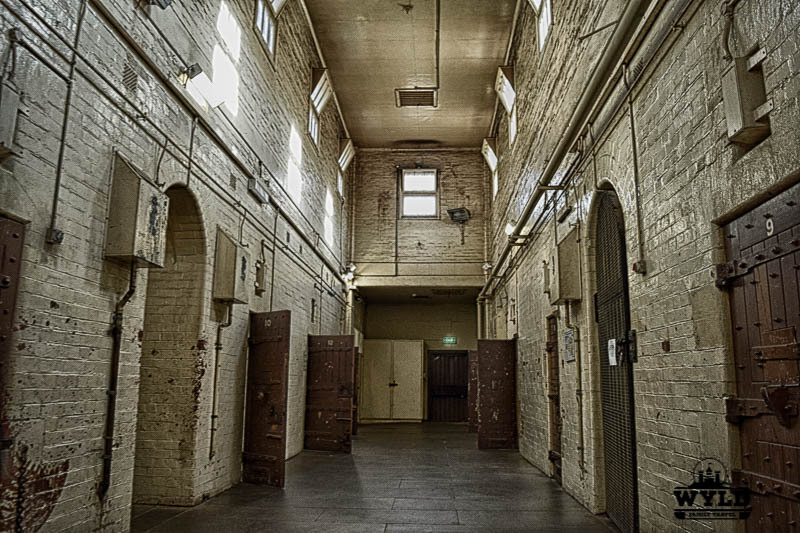 Life would not have been easy in The Old Melbourne Gaol. 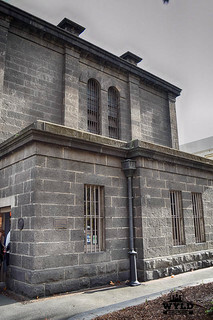 The Old Melbourne Gaol is a bluestone building that was constructed in between 1841-1844. The Gaol was enlarged continually up until 1861. The Goal, at 3 stories high, dominated the skyline of the young city of Melbourne. Built centrally in the fledgeling city the Gaol was an everyday reminder to the people of the new colony of Victoria that crime would not be tolerated. The first of the cell blocks opened in 1845. By the start of the 1850’s gold had been found in Victoria. The population of the newly formed colony rose from 23,000 to 90,000 put major stress on the Melbourne jail. Bursting at the seams with criminals a second cell block was constructed and opened in 1859. Cell blocks for females and children were finished in 1865, along with most of the major construction of this Gaol. Check out the best things to do and all that Melbourne has to offer on this hop-on-hop-off city sightseeing tour. Explore the Arts Centre, Rod Laver Arena, Chinatown, Docklands, Etihad Stadium, and lots more. Be sure to visit the Eureka Tower which has the highest public vantage point in the southern hemisphere and the world’s first “Edge Experience”. The Old Melbourne Gaol and Ned Kelly! “I have outlived that care that curries public favour or dreads the public frown…let the hand of law strike me down if it will, but I ask that my story be heard and considered”. 135 executions were held at the Old Melbourne Gaol. 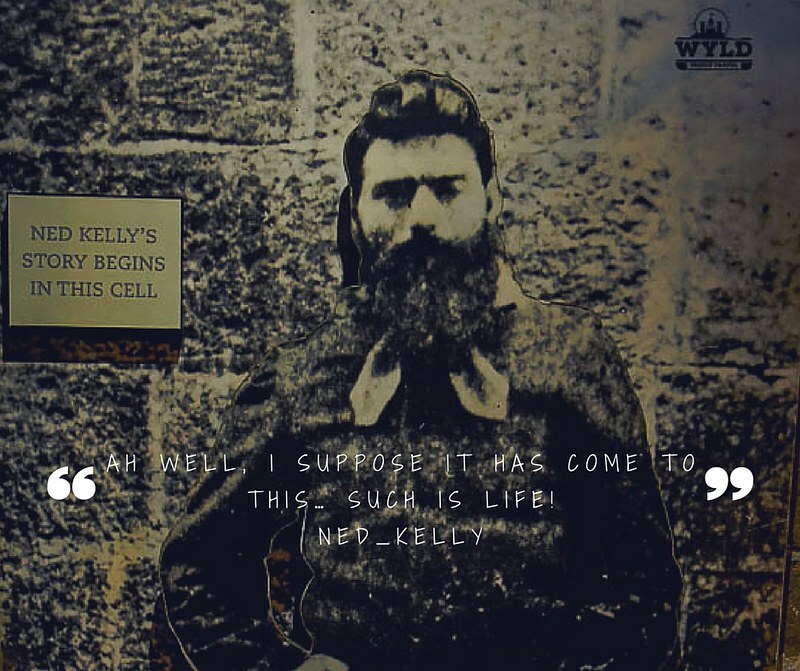 The most famous of those was Ned Kelly hanging. Kelly is somewhat of an Australian Folk hero for his defiance of the colonial authorities. Still today you find Kelly’s image on everything from T-shirts to stubbie holders. Kelly and his family were of Irish descent and the majority of Irish immigrants of Northern Victoria always felt persecuted by the English just like in their home country. In his younger years, Kelly had several run-ins with the Victorian Police. After an altercation with the authorities at his home in 1878, Kelly took off into the bush to go into hiding. I would have to say without Ned Kelly hanging at the Old Melbourne Gaol it would not be one of the best things to see in Melbourne. Where do we stay in Melbourne? Novotel Melbourne St Kilda provides a stylish setting while in Melbourne. It is situated in the area’s vibrant nightlife district, about a five-minute walk from the Palais Theatre. It’s a short direct tram ride into the city centre. Victorian police parties searched for him in the bush. After three policemen were killed in a confrontation with Kelly, the colony proclaimed Kelly and his gang wanted outlaws. A final violent confrontation with police took place at Glenrowan on 28 June 1880. By this time Kelly had designed and dressed in a home-made plate metal Armour and Helmet, Kelly was captured and sent to Gaol. He was hanged for murder at the Old Melbourne Gaol in November 1880. His notoriety affirmed him as a polarising iconic figure in Australian history, and still to this day some see him as a hero while others see his as a criminal. In 1957 the National Trust of Australia listed the Old Melbourne Gaol on its register of sites and commented that it was a site that needed preserving at all costs. By 1965 the Melbourne Chamber of Commerce had floated the idea that turning the Gaol into a museum could be good for the city as a tourist attraction. In 1972 The Old Melbourne Gaol re-opened as a museum for all to experience under the control of the National Trust of Australia.The Gaol is really well preserved and one of the Melbourne landmarks. The girls loved wandering around the cells and looking at what life would have been like to imprisoned there. Goal or jail? In general, the spelling of this word has shifted in Australian English from gaol to jail. However, gaol remains fossilised in the names of jails, as Parramatta Gaol, and in some government usage. The information was always well set out and easy to read, especially for the girls. As there were the celebrations going on for the National Trust we were also treated to a play that was put on about Ned Kelly’s short life. It was fantastic and got the crowd involved as well. Both the girls loved how the play was done and the best bit was that they learnt so much during it! The actors also happily posed for photos after the play which made the girls day. Willow spent the majority of the time wandering by herself and came to find us when she needed an answer. She also told us later that she asked workers there who happily helped her as well. There is also a limited places tour of the third level but we, unfortunately, were unable to go on it as the amount had been reached. While speaking to one of the ladies in the gift shop she apologised to us continuously as the tour would not have been appropriate for the girls to go on. We told her not to worry at all and thanked her again for the information. Eureka Skydeck – Highest Building in the Southern Hemisphere. A visit to the Old Melbourne Gaol now also includes a tour of the adjacent Melbourne City Watchhouse. We can attest that a visit is certainly worth it. The City Watchhouse is where the felons, crims, cons etc were brought to face the wrath of the law no matter if arrested on the streets of Melbourne or being brought before the court for significant crimes. The Watch House was built in 1909 and operated until 1994. The Watchhouse looks today just as it looked when it closed in 1994. The original interior is intact as it would have been if you were being held there. This includes the padded rooms and the wet rooms. The padded rooms for slightly crazy and the wet rooms for the slightly drunk. The Watchhouse Experience is a 40-minute interactive tour that is a load of fun for all. You are treated as you would have been if being held in the Watchhouse. A charge Sargent will guide you through the building. Just be warned you better answer ‘Yes Sargent No Sargent’ to any questions directed at you or there will be trouble. As a matter of fact, you will be ‘arrested’ and encounter what it is like to be locked up. 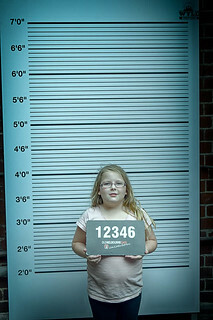 Parents note – adult themes can be confronting for children as advised by The Old Melbourne Gaol. We loved visiting the Old Melbourne Gaol with all of its histories and we could have spent many hours combing over every small piece of information that was there. We also really appreciated all the help the guys who worked there gave us. They all took the time to talk to us and the girls as well, for that we will definitely be visiting in the future. 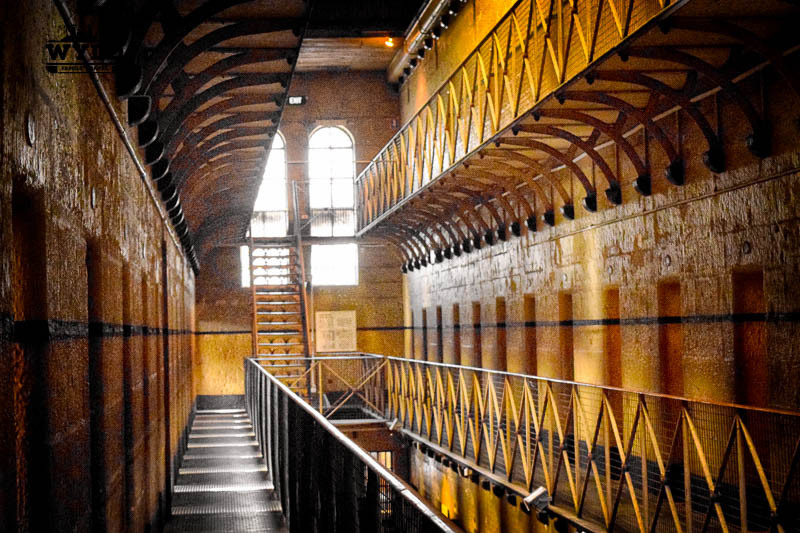 The Old Melbourne Gaol is definitely one of the things to do in Melbourne today. #We received free entry to The Old Melbourne Gaol thanks to the National Trust of Victoria. Our opinions remain our own and are no way influenced by our free entry. I always feel quite ominous in places like this and your photos give me the same feeling. I love learning history that you can almost feel.